Teaching your kids how to develop good saving habits from a young age will be a valuable gift they’ll use all their lives. Give your child a piggy bank and explain how saving will help her achieve her dreams. Make the action of putting money into a piggy bank a positive experience, starting at a young age. Kids love to imitate adults and pretend they’re “grown-ups” too. Teach your kids to put money into their piggy banks regularly. Whether it’s money from the tooth fairy for the little ones, or money earned doing chores for bigger kids: into the piggy bank it goes! When your child receives a gift of money for Christmas or for his birthday, teach him to split it in half: one half for fun and one half for savings. The reflex to save half of his money and practice good habits even with small amounts will help saving become natural and important for him later in life. 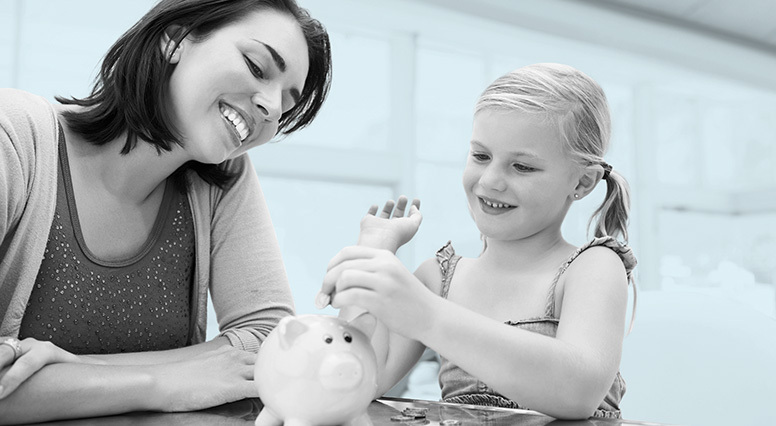 To demonstrate the value of money for your child, encourage her to save money for something she has her heart set on. It’s a win-win. By making an effort over several weeks to save for something she really wants, she’ll learn about the effort it takes to accumulate that amount of money. And she’ll appreciate what she bought even more because it’s a goal she’s achieved. To encourage your child to save, you can make an equal contribution every time he puts money away. Seeing his savings doubled will have a strong impact that will motivate him to save even more. As soon as your child is old enough to have a bank account, help her through the process of opening one, and make it an important moment. She’ll always remember the first time she deposited the savings from her piggy bank. Set an example for your little ones by showing them how you too save regularly for your own goals. Get them involved when you set a savings goal, for example for a family vacation: make it a team project! Point out milestones on your way to getting closer to your goal, and celebrate together once the goal has been achieved. This will help to create a positive view of saving. Make it into a game, to teach your kids that saving is fun! Money can be a taboo subject in many families—don’t be afraid to talk about money with your kids! When they are old enough to understand, talk to them about the value and importance of saving before spending, instead of using credit!